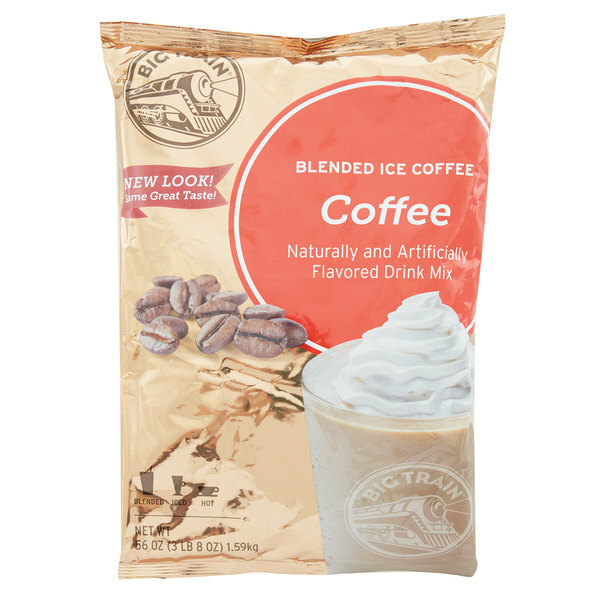 Offer irresistible flavor in your coffee beverages with this Big Train original blended ice coffee mix! With a name symbolizing strength and constant motion, Big Train has expanded into a global foodservice brand you can trust with a large number of diverse products to choose from. Big Train has become a leader in the specialty beverage mix industry, delivering easy-to-make and consistently-delicious products. Give your guests an energizing caffeine boost with signature coffee drinks that can be served hot, iced, or blended! This classic, original blended drink mix is made with nonfat milk, smooth Arabica coffee, and a hint of cocoa powder. Featuring a rich, invigorating taste your guests are sure to enjoy, this drink mix is gluten free, trans fat free, and contains no hydrogenated oil. This mix is perfect for sprucing up the menu in your coffee shop or cafe in order to offer profitable, decadent drinks. This blended ice coffee mix adds alluring flavor to your signature drinks, while satisfying your patrons' cravings for something sweet and new! For a 16 fl. oz. (480 mL) blended drink, add 5 fl. oz. chilled coffee, water, or milk to blender. Add 2 scoops drink mix. Add 1 1/2 cups ice. Blend until smooth. For an 8 fl. oz. (240 mL) hot drink, add 1 scoop drink mix to cup or mug. Add 7 fl. oz. hot water, coffee, or milk. Stir to dissolve. This item is certified dairy Kosher by OK Dairy Kosher. This mix is great by itself! It also makes a great base for adding flavor. You can adde caramel, chocolate, white chocolate. You can basically make it whatever you want. We carry this flavor in the coffee shop for the customers who like the classic taste of coffee with a nice fun twist of ice and whipped cream. Its not too sweet and not to bitter. Great morning coffee for the hot days. This mix works great for blended coffee drinks. I just use a scoop that I got from something else to make measuring out what I need easier. My staff and I love Big Train Coffee Iced Coffee mix. It is the only thing we used for our frozen blended drinks! We add flavors to spice it up for customers. no other restaurant in our town has iced coffee so this is a hit. All the Big Train flavors we use go fast. price is better at webstaurant then we have found on other sites and they have all the flavors we need. This is a pretty nice coffee mix. I mixed this with strong coffee, cream and ice and it tastes almost like an expresso frappachino from Starbucks. I use this as a base for robust syrups as well as plain coffee frappes. Hazelnut , chocolate and pumpkin spice are some examples of the robust frappes. 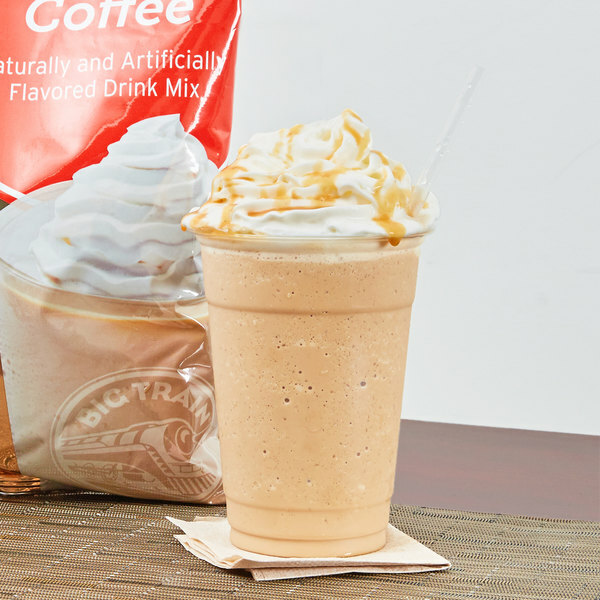 This coffee mix is a great to make frappes with a simple flavor, it is also great to mix with sauces and syrups to make different flavored "latte" frappes. The Big Train blended ice coffee mix is a great plain style mix that tastes great. The mix is very good quality and has a great coffee flavor. This is a great mix for preparing your ice coffee drinks. You only need to use what you need to use so no wasted product. Very pleased with all the Big Train products. When it comes to making blended coffee drinks Big Train is a brand you can't go wrong with- it's well known, and very versatile. This specific flavor- the regular coffee powder base- is my absolute favorite because you can do anything with it. This is the powder that has converted seasoned coffee drinkers into blended coffee fanatics. It has a great kick of caffeine, and it's not too sweet. I am new found fan of Big Train mixes because they are flavorful and a great value. They always arrive packaged perfectly. The original blended coffee mix is just the right strength and taste great. Blends up nicely for a great pick me up beverage. This mix has such a good flavor. Not only do I use it for my coffee fraps, I also use it for my caramel as well. There have also been times I've ran out of Mocha mix and added chocolate sauce to this one. Definitely one of my favorite mixes. you can use this powder for caramel and mocha. you do not have to buy mocha powder and caramel powder. i add the syrup or sauce to make caramel and mocha blend with this powder. the flavor is good and deep! not gonna go wrong with this. So yummy. Play around with the ratio of liquid to mix you use until you find a balance you like. This is wonderful for the summer time or even as a hot coffee in the winter time. For coffee lovers; this product is what you dream. You can combine it with whatever you want. ¡We love it, and we know that also you love it! This is the best to use when you want to make other flavored frappes, I have mixed it with pumpkin pie sauce, to die for!! It has just the right coffee flavor consistency of frappe it makes is awesome. It should be a staple in all coffee shops! Big Train is known for it's great coffee mixes. 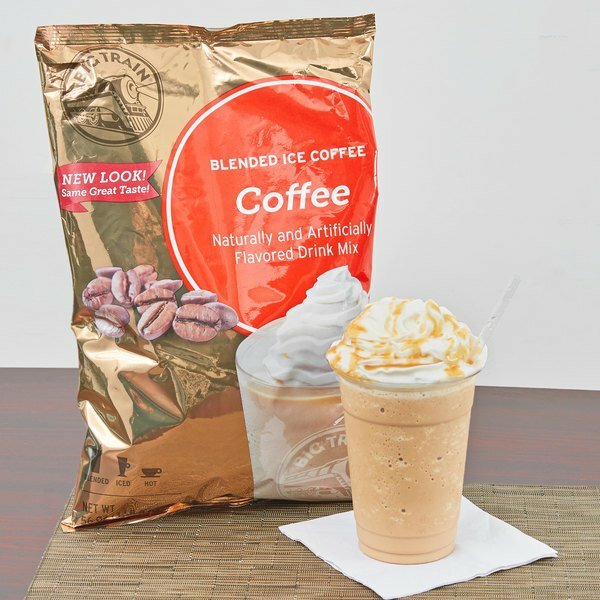 This ice coffe Mix is perfect for a smooth caffeinated drink. Definitely should be in everyone fridge. My wife and I have a cup of coffee every morning, so we are quiet accustom to the taste. Once in awhile, we splurge for a frapp, but now we can make our own in our very own home. after conducting research, Big Train is one of the BEST and most TRUSTED brands on the market and we have to say that the coffee mix is spot on! Awesome buy! I love the Big Train brand mixes and our customers do too. They are constantly telling us the frozen drinks are the best they've had. Was a bit unsure about this product because I am addicted to a good cup or glass of hot,iced, or blended coffee and am very picky. I tried it mixed with my own brewed coffee and it tasted AmaZiNg!!!!!!!!!! This item is the bomb!!!! I bought it to try and everyone at work asked what I was drinking, I offered to make them all one and they are all hooked now also. Will absolutely be buying this again. The service was amazing and my package arrived within 2 days of me placing my order, you really can't get any better than this! so glad I came accross this website, I am a customer for life!!!! This flavor is incredible delicious !!!! I use this at my shop costumers love it perfect for summer great product this brand is amazing you can not choose just one flavor ! This is my first time trying this product and I was impressed, not excited but impressed. I'm not a fan of powdered drink mixes but thsi blended very well with a few different mediums and the flavor was fresh. We LOVE Big Train! From the chai to the frozen drink mixes. It tastes great, it is neutral so we can add whatever flavor the customer desires to it, it blends up nice, and the price is really great. I would recommend this to anyone. The Big Train mix is perfect for making great tasting coffee smoothies or frappes. Many of the coffee shops in town use this mix and by buying it in bulk, the price per drink is reduced by 60-70%. Our customers loved it and want us to keep this in stock at our cafe. Highly recommend this as a new item for your store.